Electro-optical switches; Thermo-optical switches; Magneto-optical switches; MEMs-based optical switches; SOA-based optical switches; Switching based on optical nonlinear effects; Liquid crystal optical switches; Photonic crystal all-optical switches; Other optical switches; Closing remarks. Optical communication using optical fibres as the transmission medium is essential to handling the massive growth of both telecom and datacom traffic. To fully realize the potential bandwidth available on these optical fibres, other components of the optical network system have to be developed, ranging from detectors and multiplexers to buffers and switches. This book addresses the different technologies which can be applied to switching optical signals. An optical switch functions by selectively switching an optical signal delivered through an optical fibre or in an integrated optical circuit to another. Several methods are available and each relies on a different physical mechanism for its operation. The various physical mechanisms used are discussed in the main chapters in the book which cover electro-optical, thermo-optical, micro-electro-mechanical (MEMS)-based and semiconductor optical amplifier (SOA)-based optical switches. 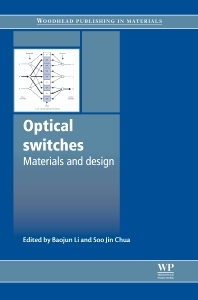 The book also covers switching based on optical nonlinear effects, liquid and photonic crystal optical switches as well as fibre, holographic, quantum optical and other types of optical switches. Each chapter discusses the choice of materials, fabrication techniques and key issues in switch design. With its distinguished editors and international team of contributors, Optical switches: materials and design is a standard reference for the telecommunications industry and those researching this important topic. Soo Jin Chua is a Professor in the Department of Electrical and Computer Engineering, and Director of the Centre for Optoelectronics, at the National University of Singapore. Soo Jin Chua is noted for their research on optical switches and other areas of optoelectronics. Professor Baojun Li works in the State Key Laboratory of Optoelectronic Materials and Technologies in the School of Physics and Engineering at the Sun Yat-Sen University, China. Professor Li is noted for their research on optical switches and other areas of optoelectronics.